Keep your business moving forward with Sharp�s newly designed AR-M355N Digital Imager� workgroup MFPs. With powerful multitasking capabilities, the 35 page per minute document system will save you valuable time and dramatically increase office productivity. With advanced copy, print, scan, and fax functionality, you will spend less time at the office copier and more time on your business at hand. 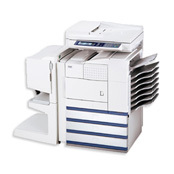 Additionally, the AR-M355N Imagers utilize a scalable design, which enables them to offer versatile document handling and finishing features, integrated software solutions, and built-in flexibility to make it easy for businesses to adopt a secure workflow that meets the needs of today and tomorrow. Standard tandem copy/print capability saves time and distribution costs when two AR-M355N Imagers are deployed on the same network. Sharp�s innovative Scan2 Technology increases productivity, enhances reliability and preserves document integrity with high-speed scanning of both sides of an original in a single pass.